Nelson County Democrat and member of the Board of Supervisors Connie Brennan announced her candidacy for the House of Delegates seat occupied by Delegate Watkins Abbitt yesterday, Bob Gibson writes in today’s Daily Progress. Brennan is a Sorensen Institute graduate and works as a nurse at UVa. Abbitt, an insurance agent, was elected in 1985. The 59th district is the largest in the state, running from the southwest quarter of Albemarle (coming within yards of the Charlottesville boundary) clear down to Appomattox, including Nelson, Buckingham, Cumberland and, bizarrely, only the western half of Fluvanna. The unusual district was carved out specifically for Del. 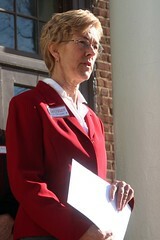 Abbitt in the 2001 Republican redistricting in exchange for Abbitt leaving the Democratic Party and becoming an independent. There’s a third candidate in the race, though he hasn’t formally announced. Buckingham’s Eric Winslow — currently a Sorensen fellow — will be running as an independent. Winslow is to the right of Abbitt, and his entrance into this race is going to make it a great deal more interesting. These disclosures get stupider every time I call ’em up. The obvious analysis here is that Winslow’s entrance would Connie an even stronger chance of victory. The bulk of Abbitt’s support comes from Republicans. If Winslow carves off even a little bit of support from Abbitt, he could throw the race to Connie. Hale got, what? 35% or something against Abbitt? Starting early and running a serious campaign from the start (unlike Hale) should get her to the low 40% range at least. Can Winslow peel off 10% from Abbitt by running to his right? I should think so. Connie could win this race with a plurality even without a particularly inspired campaign (not that I’m making a judgement about her campaign abilities one way or another). Allen Hale’s 33% quite likely represents the baseline that will vote against Rep. Abbitt — the percentage that a Democrat will get (and perhaps a Republican will get) for simply appearing on the ballot. I have to wonder whether he’s vulnerable to that 33% on either side, in which case we’ve got ourselves a three-way race here. Most Democrats will never go for Abbitt given Connie on the ballot, but I also have to wonder how much Abbitt’s Democratic past might hurt him amongst Republicans. If Winslow can paint himself as a REAL Republican, it could hurt Abbitt. However, knowing nothing about Winslow, I’ll consider him just a random name on the ballot until I see he can make some noise.